Specimens that will challenge the most experienced geologist! "What kind of rock is this?" 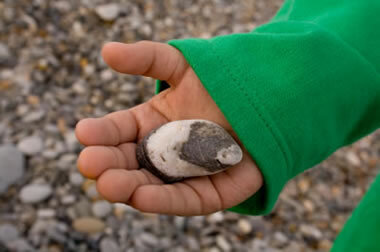 Out of a million rocks on a beach, a child will select the most unusual. The geologist might be able to identify 99% of the rocks on that beach, but the child will probably pick from the exotic 1%. Keep this in mind if you visit an elementary school! Image copyright iStockphoto / Igor Profe. If you are highly skilled at rock identification, I am willing to bet that there is a location near your home where your hand-specimen identification skills can be put to a rigorous test. The location isn't an outcrop. It's your local elementary school. 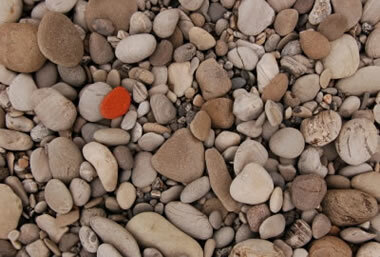 There you will encounter a diversity of interesting rocks - many of which you will be unable to identify. It does not matter how many petrology courses you have taken or how many outcrops you have studied. You will probably be caught off-guard by what students bring to school. I've done many "visiting geologist" lessons at elementary schools, and my first one remains the strongest in my mind. I was there to teach a lesson on drawing volcanoes, and the teacher told me that her students brought a few rocks for me to identify. After the volcano lesson, rocks started appearing out of pockets, lunch bags and desks. I expected them to be an assortment of the local rocks and fossils. Instead, the rocks that they presented would have brought grins to the toughest Ph.D. examination committee. Instead of seeing one or two that stumped me, there were one or two that I could identify with confidence. The rest were some of the most unusual rocks that I have ever seen! Few things bring on a professional sweat more than being in front of an audience and in over your head. To find yourself in that situation with third-grade students is a humbling experience. Rounded, shiny, colorful rocks attract children's attention. How many of these can you identify on sight? Image copyright iStockphoto / Simon Smith. Teachers Know About Student Specimens! Guess what happened during my second visit to a K-12 classroom? Right! More difficult rocks. Upon questioning the students, I learned that some of them were collected locally, some were collected on vacations and some were given to them by family members who live far away. If you are a K-12 teacher and your students bring specimens of confusionite to school, don't feel bad if you can't identify them. I know several accomplished geologists who freely admit that they have been seriously challenged by student specimens. "That's a very interesting rock. I've never seen one like it before. Here's what I can tell you about it." Many of the rocks collected by students are very unusual. 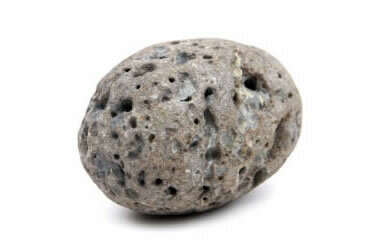 Some of the objects that they think are rocks are actually fragments of man-made objects that have been "environmentally modified." This makes the identification job a challenge. Image copyright iStockphoto / David Brimm. Why Are These Rocks So Tough to Identify? You must examine the rock outside of its environment. The child usually cannot provide a good location. You cannot do special tests on the rock. You usually examine fresh, broken specimens but children bring rounded, often weathered specimens. Many of the children's specimens are not rocks! Which of these "rocks" will a child pick up? It is probably not going to be a "representative" specimen and it might not be a genuine rock! Image copyright iStockphoto / Scott Feuer. If you are a teacher or a geologist visiting a classroom, don't be surprised if students bring in some very interesting rocks for you to identify. Being prepared for the experience can be helpful. Perhaps the most important thing to remember is that you will be handling specimens from a child's personal collection. Children can be extremely picky curators. However, they might consent to a test that will mark their specimen and then regret it later. So, it is best to examine their specimens without doing a hardness test or streak test or any other test that might mark their property. Tell the "Story in the Rock"
Children are very interested in the "story" hidden in their rock. If the student has a coarse-grained igneous stream pebble, you might draw a simple picture and explain how their rock crystallized slowly underground, then was exposed and rounded by erosion and weathering. That type of story makes their rock a piece of "Earth history" and makes their favorite rock an even more treasured possession. If you can't identify the rock, confess that to the student. If you tell them: "This is a really interesting rock and I have never seen one exactly like it before, so I can't tell you what type of rock that it is. However, here is what I know about the rock..." That last sentence can be completed with words such as "igneous," a mention of minerals that can be seen in the rock, characteristics of luster, or your suspicions that the rock is a man-made material. 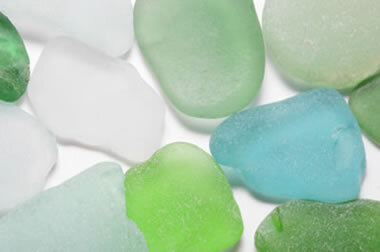 Beach glass is a common trophy! Image copyright iStockphoto / Eva Serrabassa. Many of the student specimens that I have seen are not rocks. They are instead pieces of concrete or asphalt; fragments of brick or glass that have been tumbled in a stream; pieces of blast furnace slag or expanded aggregate; and, taconite pellets or coke found along railroad tracks. Students will also bring in exotic mineral specimens, polished stones, and unmounted gemstones. Kids love tumbled stones and they are often brought to school for the visiting geologist to identify. 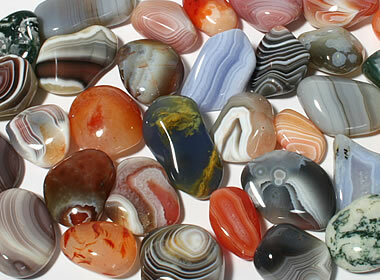 Most geologists are familiar with polished stones that are made in a rock tumbler. Students love them and often obtain them at museum gift shops, rock and mineral shows, and tourist gift shops. Students who own them have a great interest in learning their names and will bring them to school for identification. Most tumbled stones are varieties of crystalline quartz (such as rose quartz, aventurine, tiger's eye, or amethyst); varieties of chalcedony (such as agate, jasper and petrified wood); or other rocks and minerals that can be polished into attractive tumbled gems (such as lapis lazuli, hematite, labratorite, common opal, obsidian, petrified palm, sodalite, and many more. If you need to brush up on your tumbled stones, RockTumbler.com has a good page of tumbled stone photos and descriptions that will refresh your memory. I have visited over 100 elementary classrooms, and the most spectacular student specimen that I have seen was a heavy black meteorite about the same size and shape as a baseball. A student's father saw it fall from the sky when he was a child, found it in his father's cornfield, picked it up and for decades kept it in his dresser drawer. I was shocked when she handed it to me and I was able to see the textured black fusion crust of a stone meteorite with green grains of olivine visible in a small fracture. I was surprised to learn that he allowed her to transport it to school on the bus! Be prepared for anything when you have an opportunity to identify student specimens. You never know what they will bring to school! But it is a safe bet that you will see a few of these: geodes, stream-rounded quartz, stream-rounded chalcedony, scoria, blast furnace slag, stream-rounded igneous and metamorphic rocks, and a fragment of brick that has been stream-rounded. Children seem to have a special attraction to stream- or beach-rounded materials - so be ready for them.